"Just away with two suitcases to another country, just away from home otherwise I will lose my mind"
The Austrian Final was held on March 22nd at the ORF TV Studios in Vienna, hosted by Vera Russwurm. The winning song was chosen by a jury of 250 viewers who voted by telephone. 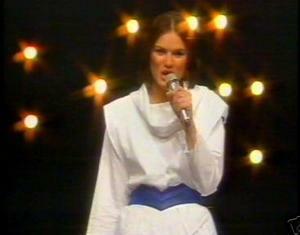 Anita came 19th at the ESC, where Gary (Lux) was one of her backing singers. Gary represented Austria in 1983 in the group Westend.